Synopsis: A woman endures hardship and suffering after her husband dies of tuberculosis. 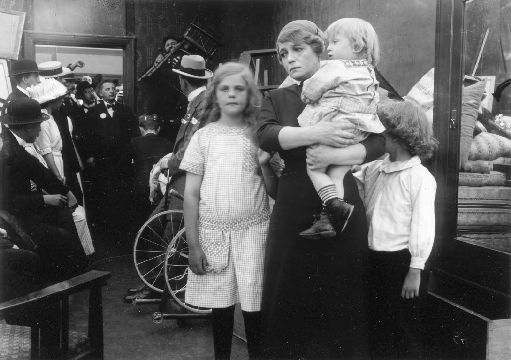 Although it’s an accomplished piece of work for its era – it’s a feature-length film that came along a full two years before D. W. Griffith made The Birth of a Nation, a film which some film historians would have us believe was the first feature – Ingeborg Holm is an utterly depressing experience which ladles on the misery before delivering an ending which, although ostensibly a happy one, doesn’t really do that much to alleviate the pain its heroine has experienced for the rest of its running time. As the film opens, the eponymous heroine (played by Hilda Borgstrom – The Phantom Carriage) is a wife and mother of three whose husband (Aron Lindgren) has just received a loan to open his own grocery store. Things go well to begin with, but tragedy strikes when her husband succumbs to tuberculosis. Ingeborg tries to make a go of the shop after her husband’s death, but a dishonest employee contributes to the failure of the shop, which Ingeborg is forced to sell in order to pay off her debts. Penniless, and unable to work because of a stomach ulcer, Ingeborg has no choice but to live in a state workhouse. To spare her three young children suffering the same hardship, she reluctantly agrees for them to be fostered out to other families. However, when one of them falls ill, the state refuses to pay for her treatment. Ingeborg Holm was directed by Victor Sjostrom, who was probably Europe’s most proficient director at the time, and even though he adheres to cinematic conventions of the day, his talent is unmistakable. At a time when many actors were still throwing their arms about to telegraph their emotions to the back rows, Sjostrom has his cast deliver more naturalistic performances, and he had a heightened sense of the importance of positioning his players in order to both derive the most impact from a shot and subtly direct the audience’s attention to the more important details. Although its bleak storyline doesn’t exactly make for an entertaining experience, Ingeborg Holm was an accurate enough depiction of the deficiencies in the Swedish social system to provoke a widespread debate on the subject which led to reforms. It seems that while Griffith was breaking new ground in the immediate pre-war years, it was Sjostrom who built upon and refined the American’s breakthroughs.